Vivian passed away on February 6, 2017 at the age of 89 in Port Orange, Florida surrounded by her loving family. Vivian was born on August 30, 1927 in Utica, NY. She was the daughter of Earla and Victor Perretta who both predeceased her. Vivian grew up and went to schools in Malone, NY and after graduating from high school she met the love of her life Maurice "Crick" McCracken. They were married for 66 years until Crick predeceased her in 2011. Vivian and Crick relocated after marriage to St. Albans, Vt where they raised three children. They had two sons, John (wife Peggy) and Maurice "Butch" (wife Patti), and one daughter, Vickie Lamothe. Vivian also had 7 grandchildren: Barney (wife Joanne), Travis (wife Chantal) and Tony McCracken, Moe Lamothe (wife Shannon), Kerry Ducolon (husband Toby), Stacie Callan (husband Mike Preseau), and Kristy Cushing (husband Corey) along with 11 great grandchildren who she loved dearly. She also leaves behind a sister-in-law Laura Adams, with several nieces and nephews along with some great friends she spent her last remaining time with at the Port Orange rehab facility. Vivian loved dogs and had many throughout her lifetime. Brandy was her special dog and best companion/friend who predeceased her a few years ago. Throughout her life spending time with family was most important to Vivian. 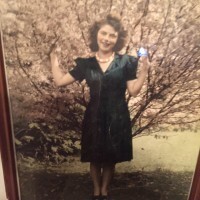 She also enjoyed spending winter months in Florida, attending early morning garage sales with Crick, and spoiling her children, grandchildren and great grandchildren every chance she got. Christmas was her favorite holiday and she always knew just how to make it memorable for all. Vivian's pride and joy was "Viv's Antique Variety Store" in Georgia, Vt. She and Crick spent countless hours tinkering in her shop and scouring local garage sales to acquire more treasures. Vivian was also known for her excellent Italian cooking and ran a pizza parlor out of her home in St. Albans for several years. Vivian loved to eat delicious food and had a passion for shopping. She would often be heard saying "let's go get some spaghetti and maybe go shopping or to the casino". Vivian will always be remembered for her kindness, compassion, love of family, beauty and great sense of humor. Her family has chosen to have her celebration of life at a later time this spring. Family has also requested donations be made in Vivian's honor to the local Humane Society in St Albans. Online condolences may be shared at: www.bradyandlevesque.com. Local arrangements are entrusted to the Brady & Levesque Funeral Home and Commemorative Services.